The Second Education Commission (1964-66) under the chairmanship of Dr. D. S. Kothari, recommended for the establishment of agricultural polytechnics to provide vocational education in agriculture to school dropouts and other rural youths. After careful deliberation by the Ministry of Education, Ministry of Agriculture and the Planning Commission and as a follow up of the recommendation, the Indian Council of Agricultural Research (ICAR) appointed a committee under the Chairmanship of Dr. Mohan Singh Mehta of Seva Mandir, Udaypur in 1973 for formulating the institutional design of Krishi Vigyan Kendras (KVK) for providing vocational training in agriculture. Krishi Vigyan Kendras (Farm Science Centre), an innovative science based institutions, were thus established mainly to impart vocational training to the farmers and field level extension workers. The concept of vocational training in agriculture through KVK grew substantially due to greater demand for improved agricultural technology by the farmers. They not only required knowledge and understanding of the intricacy of technologies, but also progressively more and more skills in various complex agricultural operations for adoption on their farms. The effectiveness of the KVK was further enhanced by adding the activities related to on-farm testing and Front-Line Demonstration on major agricultural technologies in order to make the training of farmers location specific, need based and resource-oriented. The training programmes were designed to impart the latest knowledge to the farmers through work experience by applying the principles of ‘Teaching by Doing’ and ‘Learning by Doing’. The prime goal of KVK is to impart training as per needs and requirements in agriculture and allied enterprises to all farmers, farm women and farm youths including school drop-outs in the rural area. No formal certificate or diploma is awarded, irrespective of duration of the courses to avoid the rush for jobs instead of self employment. While designing the courses, the concept of farming system as well as farming situation are taken into account to ensure that the enterprises in which they are trained are commercially and ecologically viable, sustainable and profitable. Such vocational trainings help them to sustain themselves through self-employment and to make them self-reliant economically and thus discourages them to migrate to the urban areas. KVKs provide training not only in agriculture and allied vocations but also in other income-generating activities that may supplement the income of farm families. The methods employed in training could be formal and non-formal or a combination of both, depending upon the needs but emphasis remains to be on work-experience, as suggested by Mohan Singh Mehta Committee Report that "the programme should be operated as a plan of continuing education both in the technical and general sense". 1. The first KVK on pilot basis was established at Pondicherry, Tamil Nadu in 1974. 2. All KVKs are divided into a total of 8 zones in the country (Zone I to VIII) under the name Agricultural Technology Application Research Institute (ATARI). 3. As on date, there are 645 nos. of KVKs functioning in the country. 4. In North Eastern Region (Zone III), 78 nos. of KVKs have been established till date. 5. 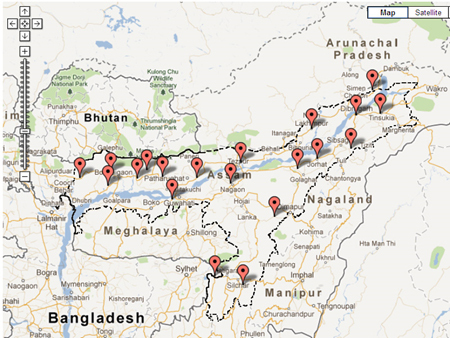 In Assam, presently 23 nos. of KVKs are functioning under Assam Agricultural University, Jorhat and 2 nos. are directly under ICAR-ATARI. 1. Conducting "On-Farm Testing" for identifying technologies in terms of location specific sustainable land use systems. 2. Organising training to update the extension personnel with emerging advances in agricultural research on regular basis. 3. Organising short and long term training courses in agriculture and allied vocations for the farmers and rural youths with emphasis on "Learning by doing" for higher production on farms and generating self-employment. 4. Organising Front Line Demonstrations (FLDs) on various crops to generate production data and feed back information. 1. To promptly demonstrate the latest agricultural technologies to the farmers as well as extension workers of State Departments of Agriculture/Horticulture/ Fishery/ Animal Science/ NGOs with a view to reduce the time lag between the technology generation and its adoption. 2. To test and verify the technologies in the socio-economic conditions of the farmers with a view to study the production constraints and to modify the technologies to make them appropriate. 3. To impart trainings to the practising farmers/ farm women, rural youth and field level extension functionaries by following the methods of "Teaching by doing" and "Learning by doing". 4. To back-up with training and communication supports to the district level development departments viz; Agriculture/ Horticulture/ Fisheries/ Animal science and NGOs in their extension programmes. "When it is understood that one loses joy and happiness in the attempt to possess them, the essence of natural farming will be realized. The ultimate goal of farming is not the growing of crops, but the cultivation and perfection of human beings."